gonnalearn.com - What are you going to learn today? 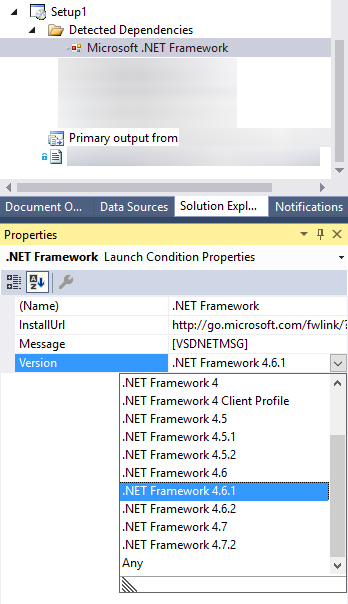 The project you want to deploy (using the setup project) targets a more recent .NET Framework than specified in the setup project’s launch conditions. 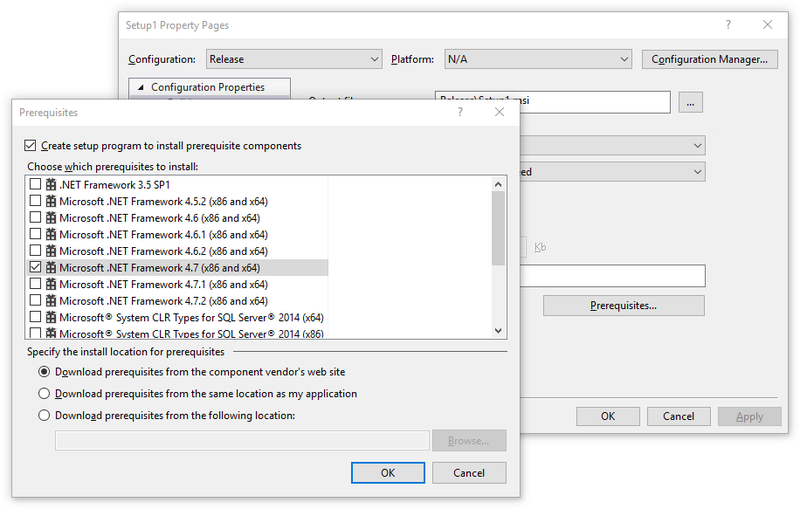 Double click on ‘Properties’ in the Solution Explorer to show this screen. Meanwhile, the setup project was still checking for .NET Framework 4.6.1 as a launch condition (requirement on the target machine). The solution: Update the launch condition version to match the target framework of your project. While this has nothing to do with the warning, you might as well check which version of the .NET framework your setup program will install (if any). Update: While I thought this issue only appears when you update you project’s target framework after having already created a setup project, it seems that it also happens when creating a new setup project. Also, changing the target framework version does not seem to update the InstallUrl (not sure if this is important). On digitalscalesblog.com, I showed how easy it can be to send the weight from a scale to a Python script running on a Raspberry Pi (if you choose the right scale). As I had never used Python before, all the script did was print the weight data. That doesn’t mean you have to stop there. Here a some ideas and links to get you going. Use the Raspberry Pi as a serial device server (from RS-232 to TCP/IP over Ethernet or WiFi). Code examples can be found in the pySerial documentation. Build a protocol converter. Most scales use proprietary protocols, but you can convert the data to MQTT or other protocols as shown here. Do not say that you have developed a protocol converter, call it an IoT gateway to get more attention. Use speech synthesis to output the weight as spoken words for visually impaired users. Use speech recognition to send commands to the scale (e.g. the tare command). Install a Pi Camera Module and take a picture of the user every time the scale is overloaded. 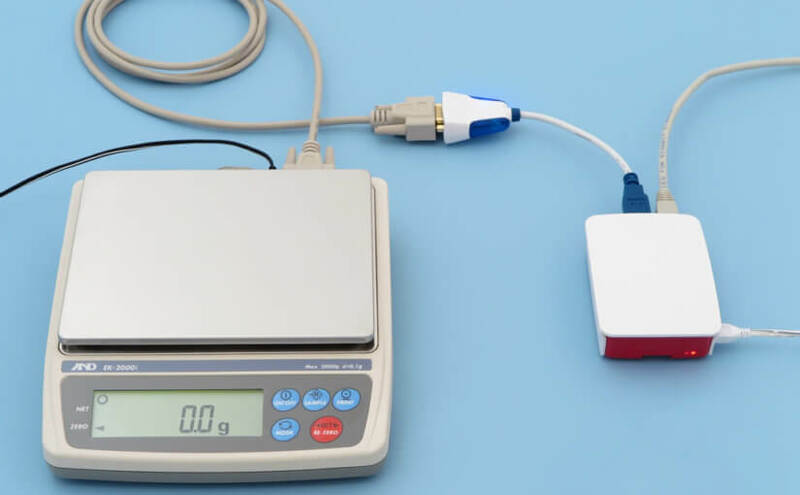 Turn the scale into a checkweigher by comparing the weight with preset values and making under/accept/over LEDs light up. Transform the weight into a proportional analog signal (voltage) because… I have no idea! Why do people keep asking for weighing scales with an analog output? Seriously, if you know the answer, please tell me.